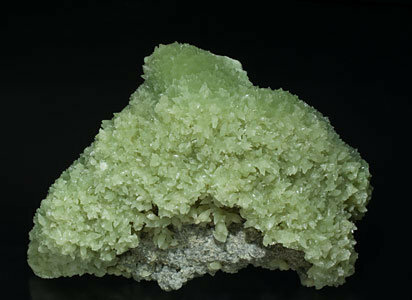 Druse of dipyramidal, strontium rich, Aragonite crystals that have slightly curved faces and edges, a light-green color and they are on matrix. A well-known classic from the Niccioleta mine. As in so many specimens in this collection, the sample is of great quality for the locality. 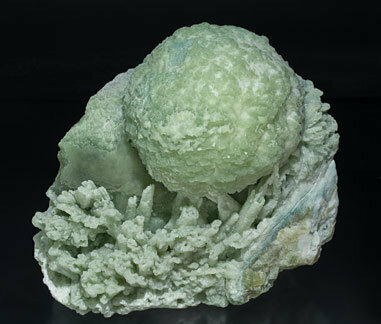 Pale green spheroidal growths that, in section, show a radial structure with concentric color zones that vary between green, more or less clear, on the border and shades between yellow and yellowish-green in the central areas. Although we have not done the analysis, these samples have been traditionally recognized as strontium rich Aragonite. As in so many specimens in this collection, the sample is of great quality for the locality.